((Vienna/Madrid)) An international group of researchers, involving scientists from the Complexity Science Hub Vienna & Medical University of Vienna and Universidad Carlos III de Madrid, developed a tool to track and analyse gender inequality through Facebook usage data: the Facebook Gender Divide. Their results, published in the latest issue of Proceedings of the National Academy of Sciences (PNAS), show that gender inequality online is related to gender inequality in society at large. The tool is based on the aggregate statistics of almost 1,5 billion Facebook users from 217 countries. It produces a measurement that the researchers call the Facebook Gender Divide. By validating their measurements against survey data the scientists show a strong relationship between the Facebook Gender Divide and standard measurements of social and economic gender inequality from the World Economic Forum. The researchers highlight the significance of the data available on social networks given its enormous potential as a monitoring tool to examine social problems with cultural, demographic and political implications: “Using these data and through cheap, fast and extensive analyses, we can take a simple snapshot of such significant problems as unemployment, health issues and the gender gap in hundreds of countries,” explains co-author Esteban Moro, a professor in UC3M’s Mathematics Department and current visiting professor at MIT’s Media Lab. 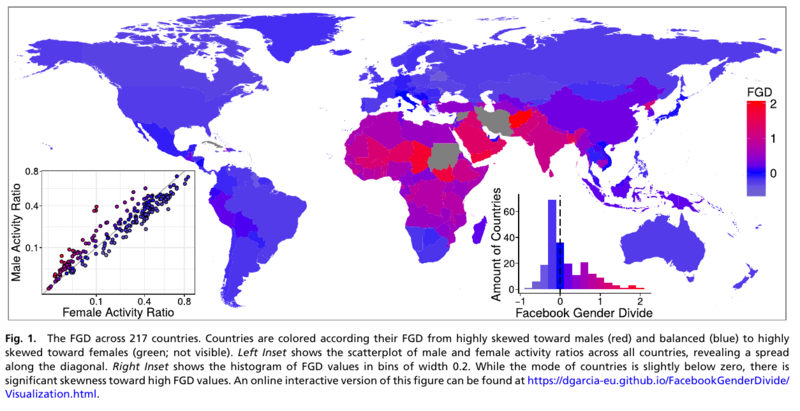 The Facebook Gender Divide shows that countries with a large gender gap on Facebook are mainly concentrated in certain parts of Africa and Asia (see map). The countries with greatest inequality are Chad, Yemen and Bangladesh, where the imbalance in favour of men using Facebook is very strong. On the contrary, ex-Soviet countries such as Moldova and Belarus have the lowest worldwide values of a Facebook Gender Divide. In some countries like Spain and the US women have a slightly greater tendency to use Facebook than men. The study, titled “Analysing gender inequality through large-scale Facebook advertising data”, was carried out in collaboration with colleagues from Australia’s national scientific agency, the Commonwealth Scientific and Industrial Research Organisation (CSIRO), the IMDEA Networks Institute and the Massachusetts Institute of Technology (MIT).